The leaders of eight European nations recently signed onto a statement of unity with the United States. The declaration, published by the London Times on January 30th, calls terrorists "the enemies of our common values" and says of the September 11th hijackings that "Those outrages were an attack on all of us." "We in Europe have a relationship with the United States which has stood the test of time," it continues. "Thanks in large part to American bravery, generosity and far-sightedness, Europe was set free from the two forms of tyranny that devastated our continent in the 20th century: Nazism and Communism." That's high praise, for a nation which our own media assure us is universally loathed. The statement goes on to warn that, "The Iraqi regime and its weapons of mass destruction represent a clear threat to world security," and that, "[U.N.] Resolution 1441 is Saddam Hussein's last chance to disarm using peaceful means. The opportunity to avoid greater confrontation rests with him." It then demands that the U.N. Security Council enforce its own resolutions. The eight world leaders who signed the document are Jose Maria Aznar of Spain, Jose Manuel Durao Barroso of Portugal, Silvio Berlusconi of Italy, Tony Blair of the United Kingdom, Vaclav Havel of the Czech Republic, Peter Medgyessy of Hungary, Leszek Miller of Poland, and Anders Fogh Rasmussen of Denmark. These men have been dubbed by their critics as the "Gang of Eight," a title that the press has picked up and run with, for the obvious reason that it portrays America's allies as lawless renegades. Greek Prime Minister Costas Simitis, whose nation is the current president of the European Union, rebuked the statement as divisive to the EU, saying, "The way in which the initiative on the issue of Iraq was expressed does not contribute to the common approach to the problem." Simitis is not himself taking a position on Iraq, you see; his concern is that the European Union address the issue with a common voice. Got that? But wait a minute. Why hasn't Simitis been equally critical of German Chancellor Gerhard Schroeder and French President Jacques Chirac? Long before the Gang of Eight made its position known, Chirac had already announced his belief that U.N. weapons inspections should be allowed to continue indefinitely. Never mind that we know there to have been scores of material breaches of Resolution 1441 -- which required Iraq to present "a currently accurate, full, and complete declaration of all aspects of its programs to develop chemical, biological, and nuclear weapons" by December 8th, 2002. As for Schroeder, his refusal to send German troops to Iraq, even as part of a U.N. force, was the cornerstone of his re-election campaign. These positions taken by France and Germany don't "contribute to the common approach to the problem" any more than those of the eight nations that have affirmed their alliance with the United States. But who does Simitis blame for fracturing the European Union? "The [Gang of Eight] letter is a move which poses a problem, because it was done without necessary consultation," he says, as if Chirac and Schroeder ever seek EU approval before speaking on their own behalf. The president of the Greek parliament, Apostolos Kaklamanis, echoed this prejudice when he complained, "The ideal of the European Union suffered a severe blow. This war is undermining the course of Europe toward its integration." Why would the impending war be the cause of the disruption, instead of French and German opposition to it? Is it because opposition to U.S. policy is considered to be the EU's standard operating procedure? If you think that sounds paranoid, ask yourself how many other plausible explanations there are for this statement from Swedish Prime Minister Goran Persson, who says he would not have signed the Gang of Eight letter had he been asked. "The division plays in the hands of Saddam Hussein." Who knew Sweden was among the world's leading exporters of guano? To hear Persson tell it, you'd think that Saddam has Tony Blair and the others right where he wants them, but that he panics at the thought of a united EU going back to the U.N. drawing board, and proposing yet another resolution, to which it has no intention of holding him accountable. Anybody who would believe that probably also believes politicians when they say, "I'm glad you asked me that," at press conferences. The very idea of a coherent European Union position on a military matter is a dubious proposition in the first place. It has in the past been suggested that the EU officially change its name to "The United States of Europe." (The objections of Great Britain seem to have mercifully squashed that effort.) If such a contrivance was intended to project upon the EU member states a common identity similar to that of the American states, its failure would have made itself known almost immediately. The original thirteen American colonies were all inhabited by British subjects, who joined forces in rebellion against the king. At the time the nation was founded, its people had a common language, a great number of common experiences, and perhaps most important to its cohesion, a common enemy. The EU, by contrast, is an alliance of separately established nations, with many different languages, cultures and experiences, whose interests are so divergent that most of its member states have been at war with each other within the past century. It isn't realistic for a nation to defer its military decisions to a jumble of other countries that don't necessarily share its interests. Great Britain, America's closest and most powerful ally against Iraq in 1991, believes that Saddam Hussein is a growing threat that must be stopped before he acquires nuclear weapons. Who are France, Germany and Greece to forbid Britain from defending itself and its allies? And why should the British people be willing to take the responsibility for their security out of the hands of their own representatives, and entrust it to the rotating leadership of the EU, which appoints a different member state to the presidency every six months? European opponents of action against Saddam certainly aren't subordinating their national interests to those of their fellow member states. It's easy to see why Germany and France would be motivated to downplay the Iraqi threat, and it has absolutely nothing to do with the integrity of the European Union. It was the French who, with the approval of Prime Minister Chirac, built the nuclear reactor near Baghdad which the Israelis thankfully bombed in 1980. One might generously assume that Chirac believed the reactor was only intended to generate power for the civilian population, but his consistent policies toward the Middle East are cause for doubt. After all, it was he, in October of 2000, who persuaded Yasir Arafat to reject a cease-fire agreement, which Israeli Prime Minister Ehud Barak and U.S. Secretary of State Madeleine Albright believed Arafat was close to signing. After the Israeli bombing, Saddam instead pursued the ability to produce nuclear weapons through the enrichment of uranium, using centrifuges provided by German scientists. Karl-Heinz Schaab's sale of stolen centrifuge technology to Iraq was the subject of a documentary film called Stealing the Fire. Schaab was convicted of treason in 1999, but the German court sentenced him only to a five-year suspended sentence, and a fine of $32,000 -- roughly half of what Iraq had paid him for the technology. That goes a long way toward explaining why France and Germany would pretend that the current Iraqi impasse is no big deal, but why should other nations like Poland and Italy be expected to agree? Just for the sake of forming a European consensus? Margaret Thatcher used to say that consensus is the negation of leadership. It seems almost as if the European Union has been created to illustrate her point. How can this collection of nations make a joint decision on whether to go to war, when it isn't even capable of electing a leader, but instead appoints each member state as caretaker for a half-year stint? This manner in which the EU determines its presidency mimics the deliberately morally vacant method used by the United Nations to fill its leadership posts. Believe it or not, this May the U.N. will appoint Iraq to preside over its Conference on Disarmament. Why? Because the succession of that position runs in alphabetical order, and it's Iraq's turn. A similar mishap has landed Libya in the chair of the U.N. Human Rights Commission. The nominating process for this body rotates geographically. It was the African group's turn to nominate somebody, so they picked Libya, and why not? By African standards, that nation's human rights record is really no worse than average. The nomination of Libya easily won approval of the full 53-member commission, whose members include such upstanding human rights watchdogs as China, Cuba, Sudan, Vietnam and Zimbabwe. The United States and Canada both voted against the nomination, but all seven EU member states on the commission abstained. That's the kind of "common approach" the current EU president is asking for in regard to Iraq. We know this because the EU Parliament has hurried through a vote in opposition to the Gang of Eight. By a 287-209 vote, it declared that, "Breaches of U.N. Security Council Resolution 1441 currently identified by the inspectors with regard to weapons of mass destruction do not justify military action." 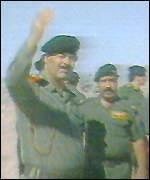 The bill also called on Saddam Hussein to "cooperate fully and unconditionally" with U.N. weapons inspectors. How do they intend to hold Saddam accountable, one might ask, when he refuses to "cooperate fully and unconditionally," as indeed he repeatedly has. Happily, they don't have to decide, because the resolution is non-binding. How convenient. Far from becoming the United States of Europe, the EU is molding itself into the United Nations of Europe. By the time the Iraqi conflict is resolved, that won't be a very enviable position. By then, that body will have so discredited itself, that any criticisms it makes of the Gang of Eight will speak as highly of those men as will any tribute paid to them by their true allies, here in America.